Galveston, TX - On September 13, 2008, the eye of Hurricane Ike, a monstrous storm with winds of at least 110 mph, bullied its way into Galveston, Texas. Waves crashed over the 17-foot-high sea wall destroying buildings and tossing boats around like chopsticks. It was the second costliest storm to make landfall in the United States. Sts. Constantine and Helen Serbian Orthodox Church survived the wreckage, but the parish lost its hall. It was nearly an immediate decision to rebuild. On Sunday, October 30, 2011 the new hall was consecrated in the presence of His Grace Rt. Rev. Bishop Longin and over 200 parishioners and guests. The festivities began with Hierarchical Divine Liturgy at the historic church, founded in 1895. It is the second oldest Serbian Orthodox Church in North America. Serving with His Grace Longin were Rev. 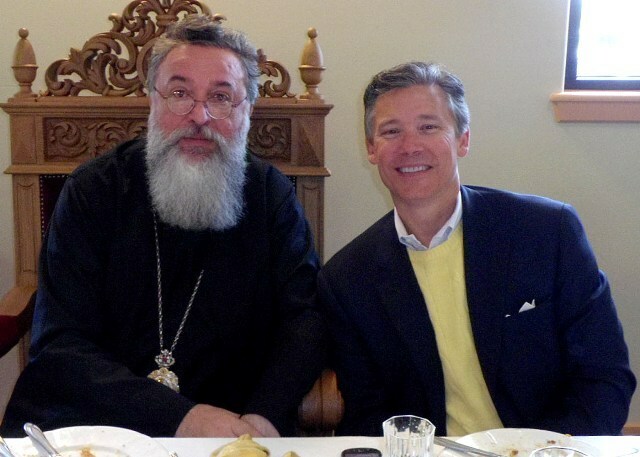 Ljubinko Savic of Holy Three Hierarchs Serbian Orthodox parish in Dallas-Fort Worth, Very Rev. Protodeacon Damjan Bozic of Holy Resurrection Cathedral in Chicago, Deacon Nikolaj Kostur of Grayslake, Illinois, and parish priest Father Srdjan Veselinovic. During the Liturgy, Father Srdjan was elevated to the rank of Protopresbyter. His Grace said it was “for his many years of service to the Holy Church on this continent.” The elevation was made on a day reflecting some of the results of Proto Srdjan’s commitment to his flock as the newly constructed hall was consecrated. Following Hierarchical Divine Liturgy, there was a memorial service in honor of all the founders and former priests who served the community. “We especially remembered Rev. Theoclitos Triantafilides Archimandrites, the first priest of this church.” Born in Greece in 1833, he died October 22, 1916. His remains are entombed in the church. Parishioners and guests filled the hall for the Rite of Consecration led by His Grace Longin. A festive banquet completed the celebration during which speakers praised the hard work of the parishioners and their newly elevated Proto Srdjan. His Grace Longin offered congratulations on the completion of the new Serbian hall. His Grace had been in Galveston for the Blessing of the Ground ceremony that kicked off the construction just 18 months earlier. “I am very pleased to see how nicely everything was done in a relatively short period of time. May God bless you and reward you for that,” he said. His Grace asked Proto Srdjan to make a presentation of Gramatas to some of the distinguished members of Sts. Constantine and Helen, among whom were parish President Peter Kovacevic and Master of Ceremonies Mimo Milosevich. Mitchell Chuoke and Gospava Popovic served as Kum and Kuma for the Blessing of the Hall. Each of them was presented with the Order of St. Sava for their many years of dedication and generosity in Galveston. The Order of St. Sava is the highest recognition given by the Serbian Orthodox Church. Also serving as Kum was Dr. Zoran Cupic who was very emotional when he spoke of the volunteerism that made the hall possible. “With the help of God, we made it,” he said as he also thanked workers and donors including Steve Stajic and his son Shane. Master of Ceremonies Mimo Milosevich spoke of the love that emanates in this small parish. “We are bigger than we seem. Each and every one of us in this room has done something to help us get to where we are today. I don’t want to leave anyone out. We did this together.” The building project became a community project as parishioners and friends stepped up to lend a hand, donate windows, do electrical and plumbing work. The result is the beautiful hall that was blessed on this sunny Sunday afternoon. Proto Srdjan received a lengthy standing ovation when he rose to speak. It is clear he is well loved in his community, not only by the faithful but also throughout the City of Galveston. “He is extremely popular,” said Mimo Milosevich later. “Over 75% of the people here today were not members or even stewards of our church just ten years ago.” Proto Srdjan has served the Galveston community for 16 years. His hard work is coming to fruition. During his visit to Texas, His Grace, along with Protodeacon Damjan and Deacon Nikolaj, visited the Greek Orthodox Church in Galveston where Proto Srdjan serves on Saturdays, and the St. Sava Serbian Orthodox Church in Houston-Cypress, Texas, served by Rev. Dejan Tiosavljevic. The Sts. Constantine and Helen Orthodox parish is the result of Serbs, Greeks, and Russians gathering together beginning in 1862. On January 13, 1895 the parish became the first Orthodox Church in the State of Texas, and is the second oldest in the United States after St. Sava, Jackson, California. The founders appealed to the Holy Synod of the Russian Orthodox Church in St. Petersburg, Russia. Tsar Nicholas II, now glorified by the Church as a Martyr, decreed: “Let there be an Orthodox Church in Galveston.” He then personally donated the icons on the Iconostasis, the Gospel book, the sacred vessels, and also sent the parish’s first priest Archimandrite Theoclitos Triantafilides. The Consecration took place on June 3, 1896 on the day of Sts. Constantine and Helen. Following the great hurricane of 1900 that destroyed much of Galveston, the Church was re-consecrated by Bishop Tikhon, later Patriarch of Moscow and glorified by the Church as a Confessor. Miraculously, the items donated by Tsar Nicholas all survived. After that time the Church came under Serbian Orthodox Church jurisdiction due to the large proportion of Serbs in the parish.